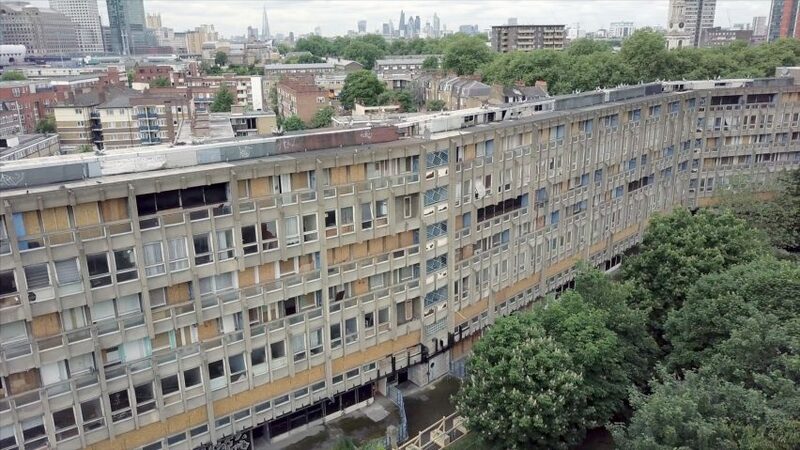 Post-war housing estate Robin Hood Gardens has topped a list drawn up by preservation body Twentieth Century Society, ranking the 10 most important 20th-century buildings in the UK to have been lost to the wrecking ball. The Lost Modern List includes a Sainsbury's shopping centre, two car parks, a corset factory and a library, as well as Alison and Peter Smithson's Robin Hood Gardens, which is currently being disassembled piece by piece. The list was drawn up by the Twentieth Century Society's director Catherine Croft to draw attention to the lack of 20th-century architecture protected by heritage listings. "As a society we tend to under-value architectural accomplishments of the preceding generation," she said. "But in time the most loathed and deeply unfashionable buildings can end up both loved and listed." "It's hard to remember just how reviled Victorian Gothic once was, now that St Pancras, which was only saved by the efforts of John Betjeman and the Victorian Society, is a treasured masterpiece and a glamorous hotel." Two designs by Owen Luder make the list – the architect has seen both his Tricorn and Trinity Square developments demolished within his lifetime. Speaking to Dezeen for a series of articles on brutalist architecture in 2014, he said: "In the sixties my buildings were awarded, in the seventies they were applauded, in the eighties they were questioned, in the nineties they were ridiculed, and when we get through to 2000 the ones I like most are the ones that have been demolished." Croft said that the pressure for redevelopment means the current listing system is neglecting 20th century architecture. Her words echo those of Simon Smithson, the architect son of Alison and Peter Smithson, who recently told Dezeen that politicians prevented Robin Hood Gardens from being listed. "The planning system is failing to protect some of our most outstanding buildings by the top architects of the post war period," said Croft, adding that many of the UK's post-war buildings were being allowed to fall into disrepair through wanton neglect. She said that buildings of the period are being "wilfully destroyed and replaced by cheap, quick fix solutions that will please no one and not stand the test of time." "Sadly the misconception that buildings constructed from modern materials like concrete and steel don't need regular maintenance means that many neglected buildings are wrongly perceived as having failed, when all they need is modest refurbishment." See all 10 buildings included on the Twentieth Century Society's Lost Modern List. The society was instrumental in rallying a campaign to save the building, which was supported by Richard Rogers, Simon Smithson, the late Zaha Hadid, Frank Gehry and Renzo Piano. Seen as one of Britain's most important post-war housing estates, the complex of 213 deck-access flats was based on the "streets in the sky" concept. The design saw two concrete slabs angled around a grassy park in the centre of the site. The western block is currently under demolition to make way for a new scheme drawn up by CF Møller, and Haworth Tompkins and Metropolitan Workshop. The art-deco building was created for American tyre manufacturers Firestone Tyre and Rubber Company by architects Wallis, Gilbert and Partners, and was based on an Egyptian temple. It was demolished by developers just days after they caught wind of the fact that the building was about to be listed. The Twentieth Century Society's protests led to the Department of the Environment carrying out an "accelerated survey" of listing. This white, flat-roofed house by Connell, Ward and Lucas bore some of the modern movement's key features – for which it was Grade II listed. But in 2003 its owner decided to demolish the house anyway, and the Twentieth Century Society campaigned successfully for their conviction. The Twentieth Century Society describes John Madin's Birmingham Library as an "outstanding example of post-war civic architecture" and the best example of his work. Despite being recommended for listing, the building was demolished last year to make way for a major development of the city centre. Included for its pioneering use of laminated timber, this factory building was designed by architect Robert Townsend and structural engineer Hugh Tottenham with Arup. Later taken over by the supermarket chain Lidl, the building was granted Grade II-listed status on the same day of its demolition. The building with the shortest lifespan on the list, this Sainsbury's supermarket store existed for less than seventeen years. It was shortlisted for the Stirling Prize and gained the highest official environmental ratings on record for the time, but was denied Grade II*-listed status and demolished to make way for an IKEA store. Lack of solid investment saw Owen Luder's Tricorn Centre – a complex of shops, flats, pubs, a market and multi-storey car park – fall into disrepair. The Twentieth Century Society describes it as the "most flamboyant of British brutalist buildings" but it too failed to achieve listed status. Dubbed the "Get Carter" car park, following its use as a backdrop for the violent death of Michael Caine's enemy in the gangster film Get Garter, the building was closely modelled on the Tricorn Centre. Again, the structure was left to ruin and demolished in 2010. The scheme that replaced it went on to be nominated for the Carbuncle Cup – the undesirable prize given annually for the worst new building in the UK. The first phase of the Barbican development by Chamberlin, Powell and Bon houses a fire station, coroner's office, mortuary, civil defence school and office of weights and measures. It was connected to the Grade II-listed residential section of the estate by a footbridge. The Twentieth Century Society, Historic England and a raft of other campaigners tried to have the building listed but the government pushed ahead with its demolition in 2008. Designed as a composing studio for the his uncle, Horder House earned architect Ted Cillinan the Royal Institute of British Architects' prestigious Gold Medal. In 2005 its new owners decided to demolish the house after a failed listing attempt by the Twentieth Century Society.